Glen Warchol | The Salt Lake Tribune Real Texas barbeque has invaded Sandy. For some reason, Sonny Bryant's, a legendary 'Q' joint opened it's only location outside the Lone Star State in Utah. Go figure: Sonny Bryan's Smokehouse, a household name in north Texas, has opened only one barbecue restaurant outside the Lone Star State. It's in a strip mall in Sandy, Utah. The wall is covered with photos, awards and memorabilia  be sure to check out the letter from French Chef Julia Child, who was anything but a snob, especially when it came to Tex-Mex and Sonny's Bryan's barbecue. I've eaten at a couple of Sonny Bryan's in Texas and, to the best of my recollection, the Utah location is pretty much on par. The Utah Department of Alcohol Beverage Control even allowed me to have a Shiner's Bock to wash down my ribs and beef brisket. But, truth be told, Sonny's isn't one of those legendary, to-die-for barbecue joints that you find in the Texas sticks. Not surprisingly, in Utah, it ranks among the top three of the handful of barbecue restaurants in state. Here's what I ordered to sustain me through a night on the town: half-pound Dinner Plate ($10.50), for which I selected beef brisket, pulled pork and ribs ($1.50 extra). I had beans and cole slaw on the side, and an excellent roll to sop up the sludge. I passed on the offer of another warm roll, but I sure could have used another Shiner. 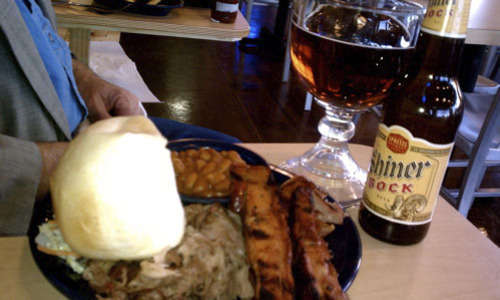 Sonny Bryan's Smokehouse, 33 E. 11400 South, Sandy; 801-619-9424 http://www.sonnybryans.com.